Ingredients for the dough: use the classic recipe for home-made pasta rolling it out thin. Ingredients for the filling: 1/2 teaspoon of nutmeg, 600 grams of Zuccherissima pulp, pepper and salt q.s., 100 grams of Grana Padano cheese, 100 grams of “mostardamantovana”, a handful of raisins. Wash and slice the pumpkin after having peeled it, then wrap the slices in aluminum foil cooking them in the oven for about 1 hour at 180°C. Then let it cool and shake it. Chop the “mostardamantovana” and add it to the mashed pumpkin. Stir the pumpkin with a wooden spoon and add the grated parmesan, a handful of raisins, lemon zest, nutmeg and a pinch of salt. Let the filling stand for at least an hour. Roll out a thin sheet and cut it into two equal parts. On one side you have the balls of filling 5 cm distant from each other. Cover everything with the other side closing the edges, after having wet the edges with a brush dipped into the water. Cut out the tortelli into squares with 4 cm sides and let them rest on a floured surface, until the time of cooking, turning occasionally. 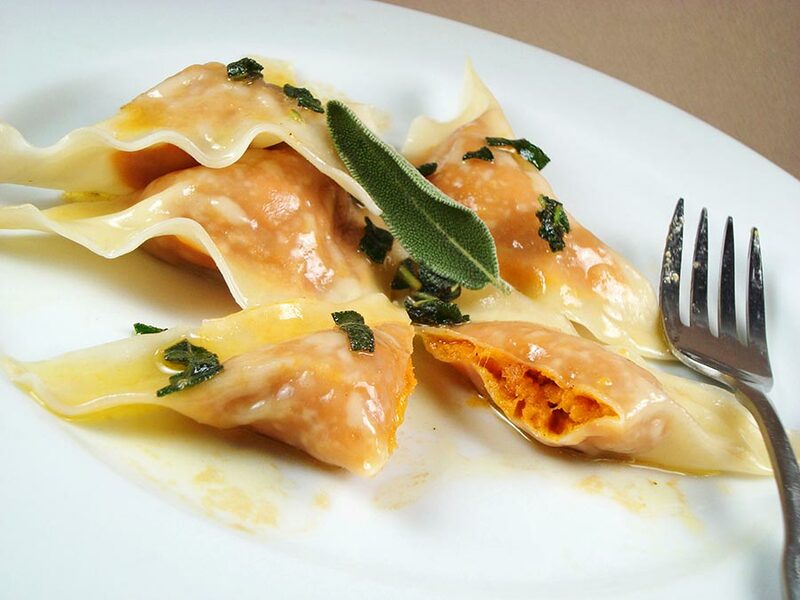 Cook the tortelli in boiling salted water. Serve them with melted butter and parmesan. N.B. it’s not needed to add the amaretti in the filling when you use Zuccherissima, because the pumpkin is already very sweet. You can use them for the presentation of the dish. The Zuccherissima cappuccino is a delightful entrée consisting of a soft pureed soup prepared with rosemary flavored Zuccherissima, which is made even more special by a soft foam of fresh cheese and cream, which precisely reproduces the “foam” of a cappuccino. The cappuccino is enhanced by a touch of plum jam and crispy sliced almonds. 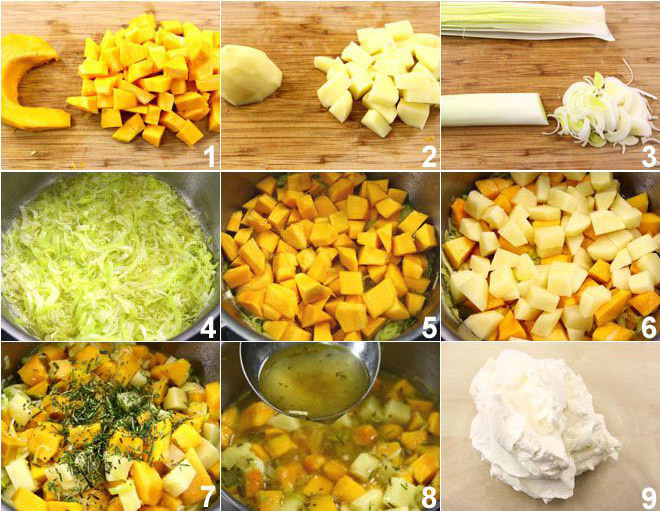 Ingredients for the pureed soup: 200 grams of potatoes, 500 ml of vegetable broth, 1 leek, few rosemary sprigs, extra virgine olive oil q.s., salt and pepper q.s., 400 grams of Zuccherissima pumpkin. Ingredients for the foam: 160 grams of Robiola or other fresh cheese, 250 ml of Fresh Cream, 2 tablespoons of plum jam, 2 tablespoons of sliced almonds. To prepare the pumpkin cappuccino start depriving Zuccherissima from the rind and seeds inside with the help of a spoon and cut the pulp into cubes (1). Peel the potatoes and reduce them into cubes too (2). Clean the leek and cut it very finely (3). Heat 4 extra virgin olive oil tablespoons in a saucepan, let the leek soften (4) and add the pieces of Zuccherissima (5) and potatoes (6), then incorporate the finely chopped rosemary (7).Sauté and season the vegetables, then add the vegetable broth and cook (8). When the potatoes and pumpkin are cooked, let them cool and whisk until you have obtained a smooth pureed soup. If necessary, adjust with salt and pepper. Then devote to the preparation of the cappuccino foam: mix the Robiola and the fresh cream in a bowl and whip until you have obtained a frothy and fluffy mixture (9), then season with a little salt and pepper. 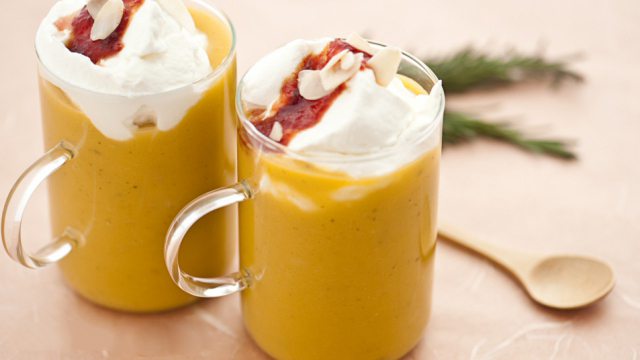 You can now compose your pumpkin cappuccino: distribute the soup in cups or cappuccino cups, add some cheese and cream foam (or a tuft, using a pastry bag),garnish with a spoonful of plum jam and decorate with some sliced almonds. Serve the Zuccherissima cappuccino immediately!